When visiting downtown Dallas, Texas, one might find, just northwest of the Woodall Rodgers Freeway, a peculiar concrete cube that rises out of a lush green garden. As its roughly carved sides give way to smooth and crisp angles while they reach nearly 14 stories skyward, its sharp corners are bisected with tubes and glass and steel cable. The Perot Museum of Nature and Science may be an ode to modern design and responsible building practices, but it houses an amazing collection of exhibits that will make any visitors heart swoon for the miracles of our natural world. The stunning museum offers 11 different exhibit halls within its cutting edge, five-story architecture. While the structure itself is designed to be an impressive exhibit on its own, with ambitious examples of engineering and conservation, inside is an array of knowledge and information that will inspire and awe anyone who arrives with even the slightest bit of curiosity and wonder. The building is plum full of exhibits, displays, kiosks, games, videos, and even interactive 3D computerized animations that beckon guests with life-like simulations. The building boasts a roof deck, a theater, a café, a museum shop and even a giant dinosaur fossil greeting guests at the entrance lobby. The Perot Museum of Nature and Science started life as a number of disparate organizations. In 1936, the Dallas Museum of Natural History first opened. Later across town, the Dallas Health Museum was opened in 1946 by the Dallas Academy of Medicine, and this museum bore a slew of names throughout its life including the Dallas Health and Science Museum and the Science Place. The year 1995 saw the opening of the Dallas Children’s Museum to great acclaim in the Fair Park area of town. It wasn’t until 2006 when these varying organizations were untied under one flag. At this point the freshly named Perot Museum of Nature and Science was already an impressive source of education and wonder, counting among its exhibits a full planetarium, an expansive IMAX style theater, and even a paleontology lab. In 2012 the organization successfully completed a fundraiser that allowed it to move to its brand new, original building in Victory Park. The Science Place and the planetarium were both closed, while the Dallas Museum of Natural History was maintained as the museum’s second campus. The building itself is meant to be the first exhibit that visitors see. Even walking through the garden on the way to the lobby, guests are met with displays and signs that offer insights to the design choices and landscaping appointments chosen for the property. The stout, drought-tolerant flora surrounding the museum was chosen to mirror the Dallas landscape and climate, and the sprawling acre of green roof space was designed to evolve over time as it mingles with local grasses and plant life. The building uses a rainwater collection system that captures run off from the building itself as well as the parking areas, and is able to offset 74% of its own non-drinking water needs, as well as the entirety of its landscape irrigation needs. The building is designed to be as environmentally conscious as it possibly can be; utilizing recycled and repurposed building materials, LED lighting fixtures, skylights, solar powered water heaters, and other off-grid electricity generation technologies that help offset its energy footprint. These efforts are well applauded by the conservation community, and the building was awarded four Green Globes from the rigorous Green Globe Initiative, an achievement few buildings in the nation have been able to secure. Wrapping around its exterior is a glass tube housing a 54-foot escalator that flows continuously along the museums façade. The Perot Museum of Nature and Science features 11 different exhibit halls, each offering visitors of all ages, from toddlers to the elderly, a unique list of displays, technologies and intriguing examples of the natural world. The Moody Family Children's Museum on the lower level was designed specifically for children 5 and younger, and offers kids a number of ways to stay engaged. The floor itself is a graphic representation of the Trinity River that guides guests though the exhibit. It contains a miniature and interactive playground recreation of the Dallas skyline, complete with the Margaret Hunt Hill Bridge and other local landmarks like the Neiman Marcus building and the Magnolia Hotel. The Children’s Museum even offers public viewing of staff feeding the numerous animals in the terrarium exhibit. The hands-on dinosaur dig is built to introduce young learners to the real life digs in and around the Big Bend area of Texas. There’s even an art lab with drop-in programs available. The Lamar Hunt Family Sports Hall is an exhilaratingly interactive hall that features a 55-foot Sports Run video exhibit where visitors can race various speedy contestants including the NFL’s Dallas Cowboy star Felix Jones, WOGA Level 10 gymnast and athlete Emily Richardson, a 3D simulation of a true to life-size tyrannosaurus rex and even a simulated cheetah. The Discovering Life hall at The Perot Museum of Nature and Science offers a glimpse into the Texas ecosystem across the scale, from single celled organism to the complex landscapes of the Piney Woods and Blackland Prairie. The Being Human Hall poses the question to visitors: What does it mean to be human? Visitors have explored the different forms of life we interact with in previous halls, but this one examines the unique experience of being human. It invites guests to examine cross sections of actual human tissues and samples, to test out a prosthetic hand, to launch a ping pong ball using only the mind, and even learn the ways the human body moves by using motion capture displays to mimic the moves of tai chi practitioners and dancers. The Texas Instruments Engineering and Innovation Hall allows visitors to create music in the museum’s sound studio or to build a functioning robot to learn about machine languages and programming instructions. The Rees-Jones Foundation Dynamic Earth Hall contains a thrilling earthquake simulator and features footage from actual tornadoes that have hit Texas. Lyda Hill Gems and Minerals Hall features the world’s largest gold nugget and the Grape Jelly Geode, a 1.5 ton mineral. The Tom Hunt Energy Hall lets visitors travel virtually through a nine-thousand-foot gas well, and experience natural gas fracking, and teaches guests about the different types of oil drilling as alternative fuels in use today. T. Boone Pickens Life Then and Now Hall shows viewers the evolution of life on Earth over the course of its 4 billion year journey. It has on display an actual alamosaurus skeleton and a model of a 35-foot malawisaurus. The Expanding Universe Hall uses high definition screens and immersive visuals to take visitors through a recreation of the Big Bang and formation of the Solar System. The Rose Hall of Birds allows visitors to use the displays to build a bird out of a selection of wings, beaks and other bird features and then put on a pair of 3D glasses and fly a simulation of their own custom built bird. The museum’s theater, dubbed The Hoglund Foundation Theater, A National Geographic Experience, is a 298-seat, ADA-compliant multimedia facility with a 4K and RealD 3D digital projection system and surround sound that offers theatrical educational programs including documentaries and independent films and covering times form before life began on earth to worlds far away from our own. The Museum Café is operated by the celebrate Wolfgang Puck and offers guests a refreshing moment to take a break and refuel with dishes focusing on local Texas ingredients. The café overlooks the outdoor plaza. The Perot Museum of Nature and Science also offers guests a Museum shop located in the atrium with gifts, mementos and ways to take the learning experience home with them. The Perot Museum accommodates rentals in a number of its halls, auditoriums and lobbies with on-site and approved caterers to service any event needs. 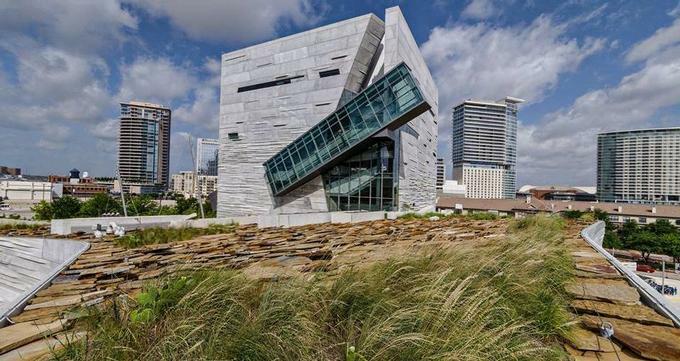 Visitors to The Perot Museum of Nature and Science will find it easy to access, located right off the 35E in downtown Dallas. It is located conveniently near the Dallas Arts District, the West End, and Uptown and easily accessible from a variety of public transportation offerings including the DART Katy Trail for pedestrians and bicyclists. The Perot Museum of Nature and Science support a number of research initiative to better understand its mission and the world around us. Much of their research centers on the work of the museum’s vice-president of Research and Collections, the vertebrate paleontologist Dr. Anthony Fiorillo. The research program at the Perot Museum also operates the largest and most active laboratory for fossil preparation in all of northern Texas. Achievements for the lab include overseeing the preparation of the Alaska skull of the Pachyrhinosaurus perotorum, and the naming of the oldest bird fossil in North America, the Flexomornis howei. The giant neck vertebrae on display at the Perot Museum, from the massive Alamosaurus sanjuanensis discovered in Big Bend National Park was prepared in this lab.